Happy Sunday and Happy Father’s Day! Before I get into my recap, I wanted to give a special shoutout to my dad for Father’s Day! Week 4 of Chicago Marathon training is in the books! I feel like the weeks are going by very quickly even though I know I have many, many weeks left of training! 4 mile run. We had a mini heat wave at the beginning of the week so I opted to do my miles on the treadmill. There is no shame in my treadmill game, especially when the temperature is in the 90’s. Unexpected rest day. I had to work in NYC and got home way later than expected. Moved Tuesday’s 2 mile run to today and went to boot camp class after the run. Both workouts were great and I think it might be because I hydrated with Spiked Seltzer before the workouts – whoops! I attended a farewell party for a co-worker right before I left the office and I was intrigued by the drink since I had never had it before – it was really good! Just another #TempoThursday! 5 miles total (2 tempo miles). I worked from home and was able to get my run done during lunch which was great. I had an ART appointment that afternoon. Rest Day. Originally I was going to do Yoga but got sidetracked. 11 mile long run with 9 one-minute hill repeats. I really love these socks! Double workout day! Body Works + Abs class (50 minutes) + Spinning (50 minutes / 20 miles). Since I missed the body works + abs class on Tuesday, I was glad to make it up today. For my long run I was out the house by 7am. Thankfully it was cloudy during my entire run because it was SUPER humid, like 97% humidity. I was just happy that I didn’t have to deal with the sun and the humidity. Overall the run went well but I did have some IT band and knee pain during the hill repeats. It wasn’t enough pain to stop me in my tracks, but I just noticed it more after the 4th hill repeat. I also tried the lemon flavored Tailwind and it was delicious! It was nice and cold since I froze water in my handheld the night before. The flavor reminded me of lemonade. I also tried a Huma gel and really liked it! I’m not sure if you have seen this great deal from Pro Compression so I wanted to include it here. You can get 60% off when you purchase any 3 pairs of marathon socks. Use code 3460 to get the discount, but hurry, sales ends tonight (6/18)! Also earlier this week I received an email from Feedspot letting me know that my blog had made the Top 100 Running Blogs list. I’m not sure what criteria they used as I don’t think that many people read my blog, lol. IT was definitely a surprise but I’ll take it! Did you have a good week? How is the weather in your city? I’m linking up with Holly and Tricia for their Weekly Wrap. This week’s guest host is Tara so show her some love! Great week Kim! I love those PRO socks too. I’m so glad I grabbed them! Yay for the 11 mile run and with hills yet. You rock! Does your dad read your blog? I don’t even think our dad knows we have a blog…haha. Thanks! The 11 miles were rough but I was happy to get them done! My dad doesn’t read my blog but I still wanted to give him a shoutout! We have your same heat wave this week-brutal! Great job on building back up to your long run in the heat. Ohh the dreaded heat wave! LEt’s hope that this week will be much better! the heat = total nemesis this week! I give you kudos for running in pants – I’m practically naked when I run in the summer, lol 🙂 Have a great week, lady! Love the Father’s Day collage – and the socks. I do love the ProCompression designs! Thanks! Pro Compression has been knocking it outta the park with their designs lately – I can’t get enough! It looks like you had a great week of training! You were busy today! I like to do two a days sometimes, just so I can have an extra rest day during the week! LOL I love your father’s day collage! Have a great week! I agree – two a days are great just to get that extra rest day! Seriously, your dad is a runner, too? Wow!! LOVE all your compression socks! I keep waiting for their sleeves to go on sale…. He’s not a runner but he did walk a 5K once (that’s where the photo is from)! If I hear of a sale on their sleeves, I will definitely let you know! I embrace the treadmill during heat and humidity days too. It’s a great option! Totally agree! Why suffer through the crazy temps if you don’t have too! Thanks! I was happy that I had some many photos to use for a collage! I’ve never thought about alcohol before I run, but now you’ve got me thinking…lemon Tailwind with vodka? Hmmmm…..
Umm…this is something that I need to do, lol! Good for you getting the work done despite schedule hassles! It was hot here too, and I don’t blame anyone for choosing the treadmill over the heat. If I had a treadmill of my own I’d probably run on it way more often! We are supposed to get better weather this week, I hope the same is true for you! I also hope that we get better weather this week as well!! Smart move taking your training indoors when the temps reached 90 degrees! It’s been a rough training week with the high temps. Keep up the strong work! Thanks! I will take the treadmill any day over 90 degree temperatures! Nothing wrong with some treadmill time when its that hot. I’d do the same! Great job this week! It was sooo humid this weekend. I dont think i could have handled running more than a few miles! Thanks Lisa! I just keep telling myself that I have to get my body used to the heat and humidity again but it’s hard! I feel the same way: Time is flying and these training weeks are ticking away. It was sooo hot all week here as well. Welcome to summer, I guess! Yup, summer running is definitely here! We are having summer temps, but thankfully not much humidity. Once I get new shoes at the beginning of July, I’m going to get back into running… on the treadmill. I don’t do well in the heat. Great photos of you and your Dad! Looks like a great week of workouts! I hope your knee and IT band are ok! Great job getting those hill repeats in during your long run! Also love the photo collage of you and your dad! Your drive and energy and so inspirational! Great week! Thanks so much Elle. You are too nice! Great pics of you and your Dad! I love those socks you had on too- just way to cool! What is not cool is the humidity I will agree! Whew! It is swampy down here! Thanks Mary Beth! The humidity has been crazy the past 3 days and right now we’re in the middle of a crazy thunderstorm! Congrats on making it to the top ?!! That sure is an accomplishment. I am jealous of your miles as I have zero in my training for Chicago unless if you count pool run as ‘mileage’. I remain positive it will all work out in the end. Thanks so much Elaine! I think that your pool mileage should definitely count toward your training! LOL exactly! I don’t have a TV on my treadmill at home but I can blast my music which is nice! Love the colour of your compression socks (both pairs). Congrats on bring in the top 100 runnjng blogs! 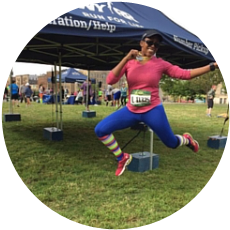 Congratulations on being one of the Top 100 running blogs! That is awesome! I just bought my first handheld. I’m training for my first half marathon and running over 4 miles in the Texas heat and humidity called for the purchase – but the guy at the counter gave me that tip- freeze some water in it the night before – I thought that was genius! Oh wow, I’ve heard about that Texas heat! You’re amazing for running outside in those temperatures and you will really appreciate the handheld! Oh man, hill repeats (nine of them!) during a long run?!? You’re a beast! thankfully they were only one-minute each but my legs were really feeling it yesterday. The DOMS was real! I feel the same way about the sun/heat/humidity. If I only have to deal with heat & humidity and not the sun, it’s bearable. The sun on top of heat & humidity is too much! Great week! Every summer I count down the days until Fall, lol. I just love Fall running! Congrats on making the list! How exciting! Sounds like you had a Rockin week. I’m glad you liked the huma and Tailwind. Keep an eye on those bands… do you do glute activation before you run? Thanks Rachel! I usually do a 5 minute walk to warm up before a run, and i do a few exercises, but I think you’re right in that i need to focus on more gluten activation moves. Looks like an awesome week! COngrats on making the top running blog list, that is awesome. You had another fabulous week. – You always do a great job of sticking to your training and not making excuses. You just get it done. Awesome! Ah those socks are very cool! I’m slacking in the sock department and have been needing to order some, but haven’t got to it! It’s either hot or rainy here, but knee highs seem to work year round. Awesome workouts for the week! A long run with hill repeats is no joke! Thanks so much Emily! The hill repeats were hard, especially since I did them toward the end of my run, but I was happy to get through them! You had an awesome week of workouts! Glad to hear that training is going so well. Hill repeats are so much fun, but definitely less fun in the heat and humidity! I need one of those R8 rollers…they work amazingly well! I wish I didn’t miss that deal on the socks, I could use a couple more pairs! Nice work! I love me some ART. I want to try the roller you have in the picture. How do you like it? That is the R8 roller from Roll Recovery and I really like it! Now I’m not gonna lie, it’s not the most pleasant experience to use it, lol. IT dips really deep into your muscles but it’s totally worth it!